Day 4: Refuge de Mottets to Courmayer | Old Bat On A Bike. We heard the wind whistling around the Refuge in the night so we guessed there had been a change in the weather. We left the Refuge de Mottets and began the 750m ascent to the Col de la Seigne. We were quite excited at the prospect of leaving France and crossing into Italy. Once again we left at 07:30 after an early breakfast and began our steady plod up to the Col. Early morning climb to the Col de la Seigne. where it was very windy and quite cold. We hastily put some extra gear on and headed down into Italy. We took care in the poor visibility below the col to ensure we found the correct way down to the Valle de Blanche. A disadvantage of our early starts meant that we were usually first up the hill with no-one to follow! About 10 minutes down from the col we found the renovated Customs House which is now an Environmental Education Centre. We continued down the valley in poor visibility towards the Rifugio Elisabetta. 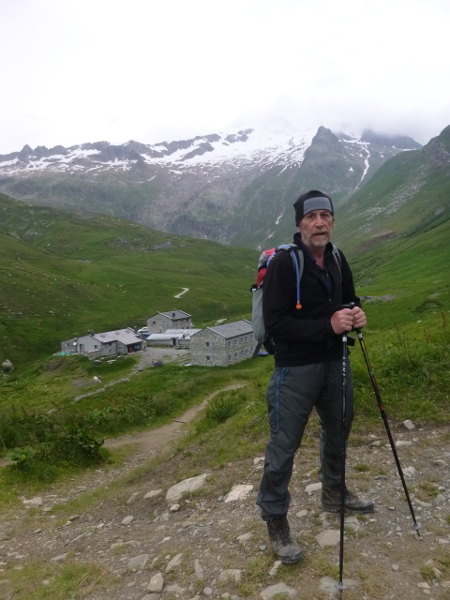 We slogged up the steep hill to the Rifugio and had coffee. We eyed up the Dortoir and were quite pleased that there was no space for us there. It was only 10:00 and we had the rest of the day to walk down to Courmayer. The route drops into the lower Vallon de la Lee Blanche and drops onto an unmetalled road built by the Italian Army. After about 45 minutes of rapid progress along this road we decided to take the high route to Courmayer. The wind had dropped and it was warm although visibility was still quite poor. We climbed up onto the Alpe Superieure and were rewarded for our efforts by wonderful displays of flowers. From our high point at 2430m we had tantalising glimpses of the Mont Blanc range across the Val Veni and views of the huge Glacier Miage in the valley below. We continued along the balcony path and eventually we were among the pylons of the skiing infrastructure above Courmayer. We arrived at Rifugio Maison Vielle and had a beer before starting the 800m of descent into the town. On reaching the valley we first reached Dolonne which is an attractive stone built village with crowded narrow lanes. We walked down through the village and across the river before walking up the hill into Courmayer. We very quickly found the Hotel Crampon, our destination for the day. We were delighted with this family run Hotel and found it an excellent place to stay in Courmayer.